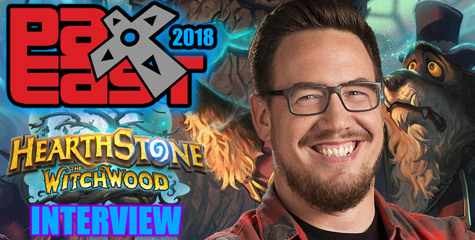 Blizzard Entertainment Rob Pardo announced at PAX East a team of 15 developers was created exclusively to develop Hearthstone: Heroes of Warcraft planned to launch beta testing this Summer. No one expected Blizzard to announce a free to play CCG game. The game is slated for beta this summer and will be released later this year (2013). It will be released in PC and Mac first with an iPad release coming shortly after. No current plans it seems on Android or other mobile OS. As someone like myself who has played Magic: The Gathering since 1998, I can tell you that this game looks like an absolute blast. The MTG video games they have recently are quite fun and this seems to be along those lines. This game looks like something for casuals as well as competitive gamers. The booster packs are expected to cost around $1, but you’ll also be able to earn them – kind of the same way League of Legends and other free to play games work where you can slowly earn what you need or go ahead and pay up front. We have an interview tomorrow for the new game. If you have any questions you’d like to see us ask add them below in the comments! At the FAQ section below there are more details about beta. Beta testing starts this Summer 2013. You can sign up to participate in beta by going to the bottom of the page at the USA Heroesofwarcraft.com website or the Europe website. BOSTON –(BUSINESS WIRE)– Pull up a chair across from an old friend at the tavern table and prepare for a few rounds of lively card-vs.-card warfare. Blizzard Entertainment, Inc. laid its virtual cards on the table today with the unveiling of Hearthstone™: Heroes of Warcraft™, a new cross-platform free-to-play game for Windows®, Macintosh®, and iPad®. In Hearthstone, players build card decks centered around one of nine iconic Warcraft® character classes and duel each other for fun, glory, and the chance to win awesome new cards. PAX East attendees are able to go hands-on with Hearthstone this weekend, and Blizzard will begin beta testing for the game very soon—no, seriously. Deceptively simple in design but epically engaging, Hearthstone will be instantly accessible to players regardless of their familiarity with Warcraft or collectible card games. Whether players prefer to wield magic or arms in battle, strike from the shadows or head on—or have never given any of that much thought—they’ll be able to jump right in, create a deck, and get in on the card-slinging action. In addition to honing their skills in practice matches against the computer and taking on their buddies via their Battle.net® friends list, players can challenge each other in two competitive game modes. “Play Mode” features traditional head-to-head battles, with players facing off for a chance to increase their medal ranking and earn card packs along the way. And for a different type of challenge, players can enter “The Forge,” where they start each match by building a deck from a new set of cards, and then use that deck to duel other Forge participants. Aside from winning new cards, players will be able to round out their collections by purchasing new card packs or disenchanting some of their existing cards to craft the ones they’re missing. With hundreds of cards to choose from, featuring a wide range of colorful Warcraft spells, weapons, and characters, players will have limitless possibilities for developing and fine-tuning their deck-building strategies. Further details about Hearthstone: Heroes of Warcraft will be announced as development progresses. To learn more about the game, stay tuned to http://www.PlayHearthstone.com. With multiple games in development, Blizzard Entertainment has numerous positions currently available—visit http://jobs.blizzard.com for more information and to learn how to apply. Jason Hayes announced via twitter that he composed the The Hearthstone: Warcraft of Heroes soundtrack. 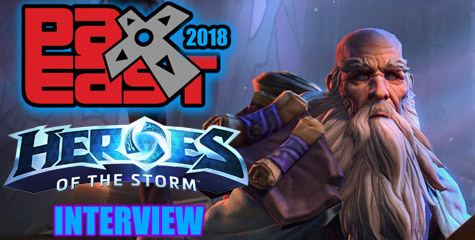 Blizzard employees/developers talk about the development of Hearthstone: Heroes of Warcraft and more about Team 5 and their role at Blizzard. Basic cards are the “starter” cards that form the foundation of each hero’s class, and are earned each time you play a game (you can have up to two of every basic card in the game in your collection). Expert cards are cards that can only be found in card packs or created using the crafting system (certain achievements grant them as well). They’re distinguished by their rarity—common (white), rare (blue), epic (purple), or legendary (orange). Generally, the rarer a card is, the more complex it is . . . often providing you with new strategic options. You can have any number of expert cards in your collection, though only two of any common, rare, or epic card, and one of any legendary card, can be placed in a deck. We do plan to test the in-game store during the beta test, and players will be able to purchase card packs using their Battle.net Balance or other Battle.net-supported payment methods. Players will also be able to obtain cards through Practice mode, Play mode, and The Forge. The card pack price in the beta test does not necessarily reflect what the final prices will be at launch. Expert cards can be “disenchanted”—giving the player a resource called arcane dust but destroying the card in the process. Once a player collects enough dust, they can use it to create any card in the game, including Golden cards, permanently adding that card to the player’s collection. The amount of dust received and/or the cost of the card created depends on the card’s rarity (common, rare, epic, or legendary). Only expert cards—that is, cards that come in card packs or are earned through playing in The Forge—can be disenchanted. Basic cards (i.e., cards with no rarity indicator) cannot be disenchanted. On Windows and Macintosh PCs, players will be able to purchase card packs within the game using their Battle.net Balance or any other Battle.net-supported payment method attached to their account. On the iPad, players will be able to make purchases using the payment methods they’ve associated with their AppleID in the App Store. The exact process will differ slightly for each region. We’ll provide further details as we get closer to launch. PAX East 2013 Speculation – Warcraft Battles or Heroes of Warcraft ? Kevin Carrillo (Sixen), Eldorian & DJTyrant (Blizzplanet), Eroldren and Medros (AllThingsAzeroth) have been brewing a barrel of speculations of what Blizzard Entertainment might be announcing today in barely 5 hours from the time of this posting. The first thought is Blizzard All-Stars. However, Blizzard Entertainment already announced this game at BlizzCon 2011, and attendees even played it. The press invite says Blizzard can’t wait for us to have this on our hands. Blizzard All-Stars has already been on our hands at BlizzCon, and second — why so much secrecy about a game that has already been announced? Unless it’s a brand-new game nobody has heard of yet. Rob Pardo tweeted recently the announcement is Blizzard’s NEXT GAME. Considering Blizzard stated in the press invitation this (New Game) is not a sequel, expansion nor related to the Next-Gen MMO Titan — there isn’t a lot of room to speculate on. StarCraft: Ghost — The press invite says different to our other games. As stated above it could be interpreted as non-MMO, non-RPG, non-RTS. StarCraft: Ghost was an FPS game. StarCraft: Ghost was postponed (meaning: to put off to a later time). PS4 was just announced and Blizzard is supporting it with Diablo III (PS4). Project Blackstone — either stand alone new game based on StarCraft, or part of StarCraft: Ghost. World of Warcraft TCG Online — the Cryptozoic Entertainment World of Warcraft Trading Card Game has been very popular. What if Blizzard brings it to mobile games? Glenn Rane (Blizzard Art Director, Creative Development) recently joined a team of friends and launched a Kickstarter to develop InKarnate … a digital RPG tabletop or Roleplaying-Game Tool Set. What if … WoW TCG Online or WOW RPG Tabletop online? Heroes of Warcraft. Warcraft Battles. This title really sounds like a mobile game. Could it be something akin to Pet Battles, but instead of pets, it’s heroes? I know, that sounds a lot like Blizzard All-Stars, but that’s DOTA-style. I mean … Street Fighter-style. Mortal Kombat-style. Just the other day, Chris Metzen and Micky Neilson were playing Samurai Showdown2 — for example. The community has certainly been pulling their hairs on this one ever since the Press Invite, and it just shows how much love and passion we have for Blizzard Entertainment and their video games. Whatever this new game is, it will have a lot of expectations and criticism. Something worth discussing throughout gaming websites, fansites, forums and social media. Whether any of us was right or wrong, it doesn’t matter no more. The game will be announced within a few hours. Make sure to watch the Twitch Livestream to witness the official Blizzard game announcement. Make sure to check it out. Spread the word! Share the link to this page. After a 90 minute flight delay, @Miaari has arrived to Boston, Massachusetts. Thank God, sound and safe. We wish her to have fun at PAX East in less than 10 hours. We will be gathering questions right after Blizzard announces the new video game for our scheduled video interview. Miaari is there to forward your questions. Stay tuned. Make sure to check it out tomorrow. Spread the word! 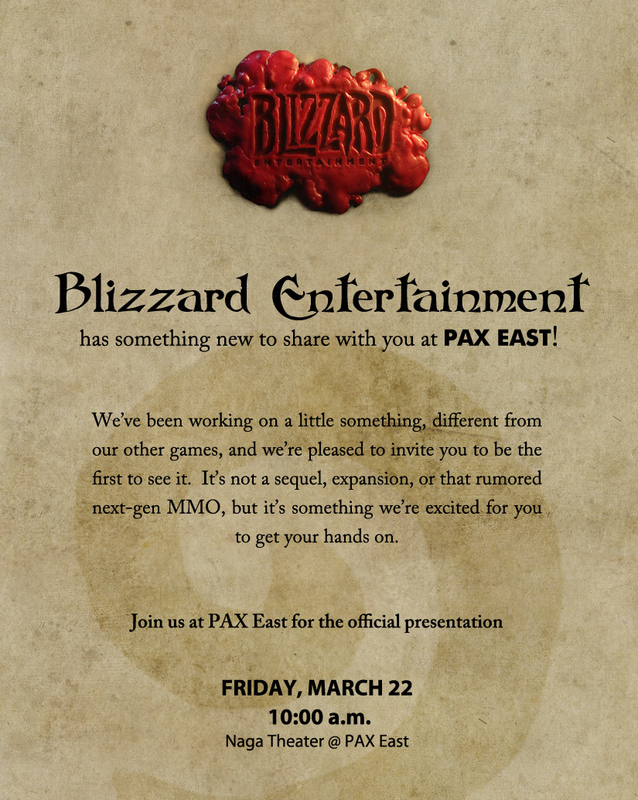 Blizzplanet staff member Miaari is attending the Blizzard Entertainment Press Event at PAX East 2013 in Boston this upcoming Friday, March 22nd. Blizzard Entertainment invited a handful of Gaming sites and fansites to the event, including Blizzplanet. There, Blizzard Entertainment plans to announce a new video game. There are two things we want our visitors to know. 1. Miaari is taking video of the entire game announcement. Make sure to check us during the weekend for any update on when the video will be available or subscribe to our Blizzplanet Weekly YouTube Channel for an automated alert. 2. We are taking questions from fans to forward them to the developers at PAX East. You can ask bonafide questions about Diablo III (PS3) or about the new game to be announced. You can submit your questions below in the comments (can login with Facebook, Google or Disqus account), or you can submit your question at the following Facebook page or via Twitter using the @Blizzplanet #BlizzardPAXEast hashtag. If you didn’t watch our most recent Blizzplanet Weekly with host Chris Arnone, click the image below to launch the video. He discusses our speculations on what this new Blizzard game is. Could it be related to StarCraft II Project Blackstone? Warcraft related? A mobile game? In this week’s Blizzplanet Weekly, our host Chris Arnone talks about several topics around all Blizzard Entertainment video games. Mists of Pandaria will see no additional 5-person dungeons, Major League Gaming (MLG) in Dallas is this weekend where 32 players will clash to the end to claim the victor prize, Diablo III developers are moving away from the Auction House, and finally — Chris Arnone enumerates what are all the facts surrounding the new game Blizzard is revealing at PAX East, and what it is certainly not. Will it be something related to Project Blackstone? Maybe a revamped StarCraft: Ghost intermingled with the Heart of the Swarm story? Will it be an MMO or a Mobile game? Everyone thought the Project Blackstone website was a promotional campaign for StarCraft II: Heart of the Swarm. However, there are still some unlocked content and absolutely nothing is mentioned about Project Blackstone in the Heart of the Swarm single-player campaign. The Project Blackstone creator, Cameron Dayton (Senior Story Developer), tweeted recently “I think it’s starting to dawn on people that #ProjectBlackstone was more than just a promotional piece for #HotS – this story ain’t done yet” — hmm? A few weeks ago, I remember Cameron Dayton revealed Project Blackstone’s story took two years in the making. This put me to rethink and ponder … does a website story and the ficticious characters tweeting each other on Twitter take two years to write? Or is there more to Project Blackstone than just a Free online short story? That’s a lot of time and manpower budget. Watch today’s Blizzplanet Weekly with our host Chris Arnone speculating about PAX East new game announcement here. Don’t forget to subscribe to our BlizzPlanet Gaming YouTube channel and to like our video. Note: Chris wears a different Warcraft, StarCraft or Diablo T-shirt on the shows courtesy of JINX. Get yours here. Who wants a PAX East Ticket to play Diablo III PS3? Blizzplanet is giving away a Sunday-Only ticket for PAX East to go play Diablo III on PS3. To join the drawing for a chance to a FREE ticket, simply “post” a comment at the following [YouTube Blizzplanet Weekly page] saying: “I want a PAX East ticket”. Don’t forget to subscribe to the channel. Hurry up, though. PAX East is next week. The winner will be announced on Sunday, March 17th. Be sure to check out your YouTube inbox that day or to check out our Blizzplanet news (front page) for the winner announcement. 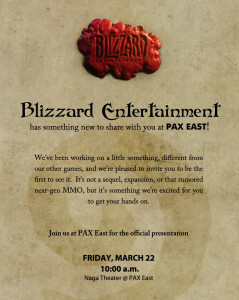 Blizzard Entertainment today confirmed the big reveal event at PAX East 2013 will be a public event — not Press-only as many of us on the media side wondered, as the email invitation was sent to press only originally, not to Blizzard customers in general. Those of you who are attending PAX East on “Friday”, read the details in our previous article. The event will be held on March 22nd at 10:00 a.m. EST. Blizzard has a little something new, and they’re bringing it to PAX East! It’s different from their other games, so it’s not a sequel, expansion, or that rumored next-gen MMO. Be among the first to see what the legendary development studio has been working on in this presentation. Blizzard Revealing New Game at PAX East? Blizzard Entertainment emailed several fansites and press writers a mysterious email inviting us to be alert to a special announcement at the upcoming 2013 PAX East. Blizzard: “We’ve been working on a little something, different from our other games… It’s not a sequel, expansion, or that rumored next-gen MMO, but it’s something we’re excited for you to get your hands on”. The public already knows that the Diablo III (PS3) will be playable at PAX East. There are demo stations for PAX East attendees to play the PlayStation 3 version of Diablo III. Thus, this cryptic email is suggesting there is something else Blizzard Entertainment is planning to reveal at the upcoming event. It is not a sequel (rule out StarCraft III, WarCraft IV, Diablo IV). It is not an expansion. (rule out World of Warcraft: The next-expansion-title, StarCraft II: X-title, or Diablo III: x-title). It is not either the next-gen MMO. But it is something we will be excited to get on our hands. Hmm. So this seems to be the announcement of a new game that is secretly in development. It could be Blizzard All-Stars, but since we already know that game has been in development, and 2011 BlizzCon attendees already played a demo — I lean to think this might be something new we haven’t heard about before. 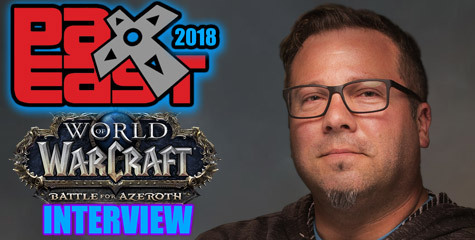 The PAX East event where Blizzard Entertainment plans to make a mysterious announcement will be held on Friday, March 22 at 10:00 a.m. (Naga Theater @ PAX East). UPDATE: Blizzard Entertainment announced Hearthstone: Heroes of Warcraft at PAX East. It was the mysterious game announcement mentioned in this article. Read more at our PAX East 2013 coverage page.